I don’t have much experience with the character of Shazam, other than that short 22 minute animated film with Superman and his appearance in “Kingdom Come.” While I did enjoy that short animated film, I won’t sit here and profess to be a huge fan of the character. Like most everything Geoff Johns writes, he’s peaked my interest in the character. It happened with Green Lantern, then again with the JSA, and most recently with his exceptional Aquaman run. What Johns does so well is he takes any prey conceived notions the reader may have of a character, flips them on their head giving you a new perspective, while remaining faithful to the mythology. 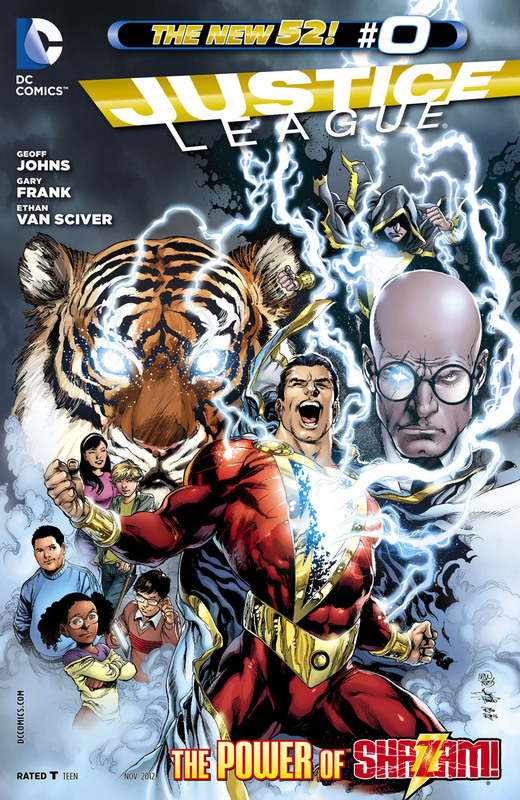 My preconceived notion was that Billy Batson was this gee whiz happy-go-lucky kid, who when transformed into Shazam is an overgrown “Beaver Clever.” Instead, we have a 15-year-old teen, who’s parents are gone, and he’s made the rounds of his foster home system. He doesn’t trust people because they always let him down. 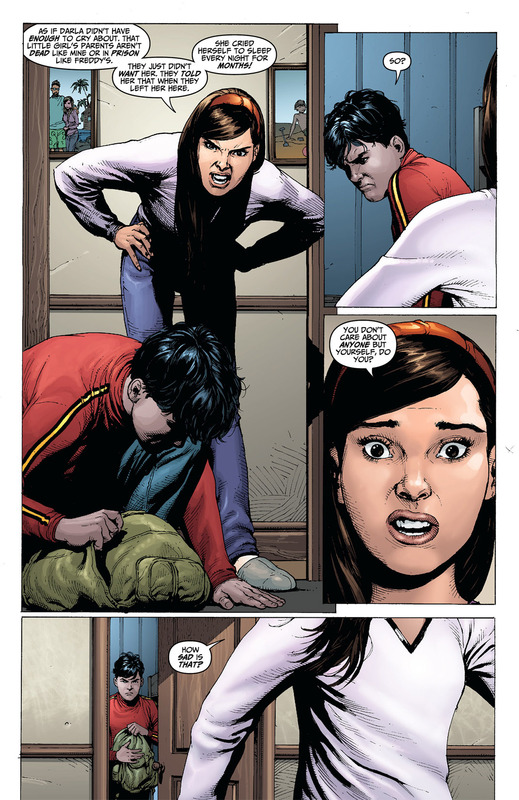 The fact that Billy Batson, is now this flawed teenager is a positive. He’s got his fair share of problems, but the magic of the last of the Council of Wizards see’s the potential for good in him. This works on two levels. First, it is in keeping with one of the goals of the New 52, trying to humanize these great larger than life characters. Secondly, it’s an accurate representation of real people, flawed yet inherently good. I thought that the 15-year-old pointing this out to the ancient magical wizard was a nice touch. Had it been reversed, as is typical it would have seemed overly preachy. Johns smartly introduces us to Billy and makes us invest and care about Billy Batson, before bombarding us with the history of the magic Billy inherits. Now I really want this kid to succeed and grow into the power he’s been given. It becomes so much more than just flashy magic powers. We get very little in these first six issues on Dr. Sivana. All we know is science has failed his family, so know he’s turning to magic. I’m curious as to what that means, and why he thinks releasing the guy who wants to unleash the seven deadly sins on the world is such a bright idea? My only criticism from a writing standpoint is the other adopted kids that make up Billy’s family. Mary is the only one with actual character. I like her leadership quality. Other than that, the rest read as stereotypical clichés. This is the third time I’ve read a story with Gary Frank’s art. The first time I hated it. Not because he’s a bad artist, but his Superman run was too slavish to the Christopher Reeve era of Superman. The character really needs to step out of that shadow, but that’s another article. His work on “Batman: Earth One” was solid. I admire the stylistic risk he took with Alfred, that was unique. I absolutely love his work in this! Every character has a distinct look. Gary’s depiction of winter/Christmas scenery looks great. Makes me yearn for Christmas that much more. The Rock of Eternity looks great. It has that mix of fear and wonder that the thought of magic often elicits. There’s a great image of Dr. Sivana’s eye with the lighting bolt through it, which is one of my favourites of this story. The ancient wizard looks less like Gandalf or Dumbledore and more like Moses, but I’m okay with that. As I’ve stated before, many of DC’s superhero’s in the New 52 have a youthful appearance about them. Not so for Shazam. Drawn by Gary Frank, he may just be the most physically imposing adult superhero off the bunch. That’s irony, given that his alter ego is still a kid. My only qualms about the art is the way Gary Frank draws characters smiling. They look downright creepy, it’s freaking me out a little. If you like superhero origin stories, you’ll enjoy this. I do, and I did. Half the fun is watching the protagonist grow into the hero he could be, or was sometimes meant to be. 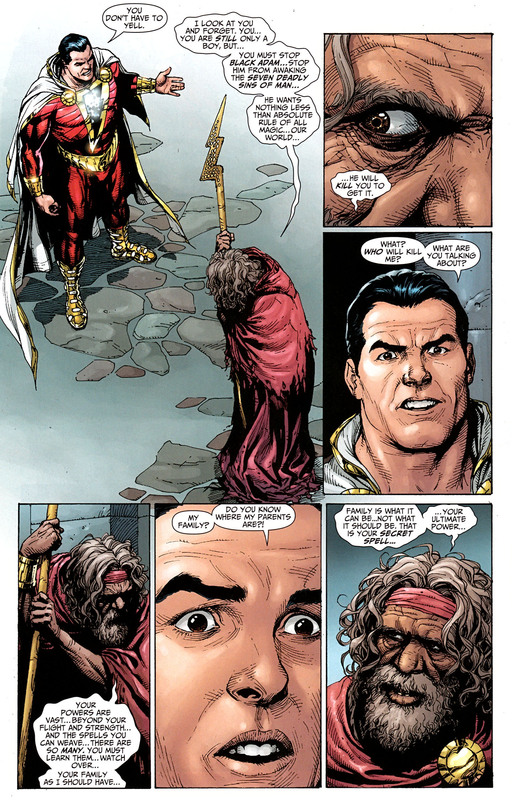 Billy Batson certainly has a long way to go before earning the moniker of hero, but I’ll be along for the ride. Forget Houdini, Copperfield, Criss Angel, or “Magic Mike”, who has female movie goers fawning all over themselves. 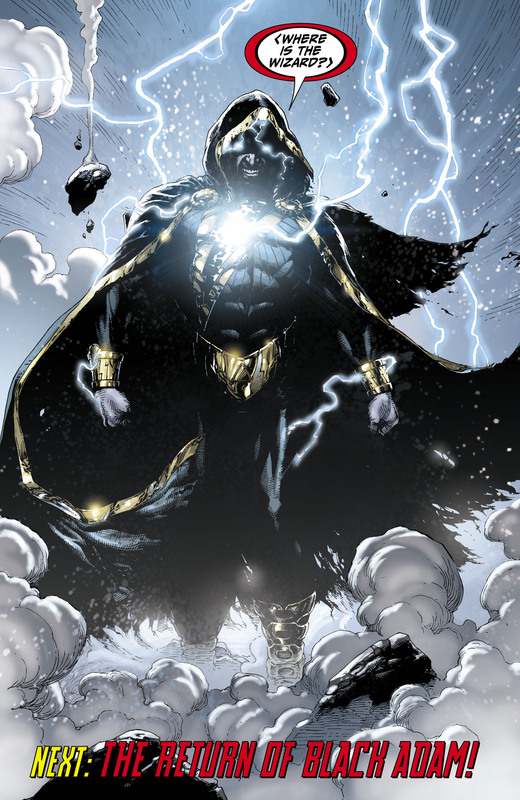 Magic resides in the work of Geoff Johns, Gary Frank, and a boy named Billy Batson. ← Man of Steel Flies To The Top of the Box Office Worldwide Setting A June Record!